Occasionally I see the movie before reading the book. This is usually accidental, but when it does happen my enjoyment of the film is much greater. Not surprising, because it is like any other movie at that point, and I can immerse myself in it without having to keep one portion of my mind on the lookout for the abominable CHANGES. I had the pleasure recently of watching Coraline, which is based on the book by Neil Gaiman. I was curious to see it because it was made by Henry Selick, and used stop-motion animation. A cross between a fairy tale and a horror story, the plot follows a little girl who has just moved to a new house where there is nothing to do and no one to play with except the very weird boy next door, and various odd grown-ups. She is unhappy because she is being ignored by her busy working parents. When she finds a magical tunnel that goes from her apartment to another one identical to her own and populated by her cooler “Other-Mother” and “Other-Father” who dote upon her, she is thrilled. Her neighbors in this parallel universe are much more interesting, the dying garden is instead bursting with gorgeous life, and the food is great. One tiny detail kind of bothers her though – everyone there has buttons instead of eyes. When she refuses to accept her own pair of button eyes, things start to spin out of control. Visually the movie was stunning. The colors were dark, but rich and glowing. The sequence where Coraline explores the Other-Mother’s garden was beautiful. Even though I didn’t get to see the film in it’s original 3-D, the animation still seemed to pop right out of the screen. The music was really interesting – a lot of English schoolboys singing, but the effect was perfectly pretty and creepy at the same time. I really liked Coraline – I was fascinated by the quirking of her little mouth, and it didn’t even bother me that the voice coming out of it was Dakota Fanning’s. I was overall impressed with the film, and very eager to read the book. More of a novella, the book took an hour to get through, and it was one of the best book to movie transformations I’ve seen recently. Blow by blow the events followed the same path, with the only addition being the character of the neighbor boy (which was actually a good call I think), and the only differences being more of an expansion of details, such as what it is that Coraline’s parents actually do for work, etc. The mood of the book was captured in the movie and elaborated upon a little, making some of the spookier moments a little more so, mostly just because of the visual impact. 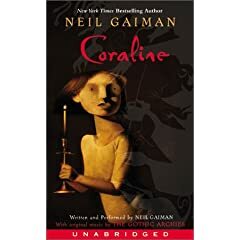 As a book and as a movie, Coraline is loads of fun, and matching Neil Gaiman with Henry Selick was brilliant. I kind of hope they do it again sometime. I’m very interested to see this movie – having read the book first, I don’t know if I’d be more critical of it than you would. I’ll be curious to see what you think, Kelia. It’s a tricky thing, book to movie transitions. We’ll see! I hope you can see it soon!